A yo-yo. A snow globe. A rubber ball filled with glitter that flashes blue light when you bounce it. A magic wand filled with sparkly confetti suspended in a pink gel. Kaleidoscopes. These are some of the toys we keep in our offices. Why? 1. They aid in creativity. There is something about toys that sparks ideas and loosens up that elusive, hard to define thing called creativity. One of the reasons kids have such great imaginations is that they play. Pacing around the office, bouncing that rubber ball, watching the blue lights flashing and the glitter spinning, is a great assistance when plotting a book. 2. They help your concentration. What? Aren’t toys a distraction? In a way, yes, but a good distraction. They occupy the conscious mind so the ol’ subconscious can have a chance to be heard. We have a plastic box with a clear cover that is about the size of a deck of cards. It is a tiny maze with several silver balls. The object is to get all the silver balls into the center of the maze. Just spend twenty minutes trying to do that! Your conscious mind will be so swept up in the challenge that your subconscious will soar. 3. They break your focus. New ideas come from thinking in new ways. Staring at a page of writing, thinking the same old thoughts about the characters, can feel like being on a treadmill. A few minutes playing with a kaleidoscope can be enlightening. 4. They are calming. 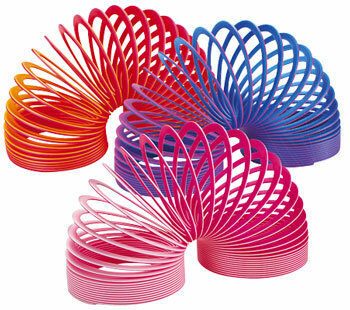 Slinkys® are especially good for this. The motion and the sound are soothing. Get a nice rhythm going and you will discover their therapeutic powers. 5. They make you feel good. Simple, effective, non-addictive, toys are the perfect pick-me-up. So if you are feeling discouraged over a stuck story line, grab that yo-yo. You simply cannot feel bad while using a yo-yo. 6. They are fun. Toys are pure enjoyment. They exist to entertain. So why not have a little fun? We know we’re not the only ones to have stumbled on this secret, and it certainly applies everyone, not just writers. Do you keep a toy or two in your office?